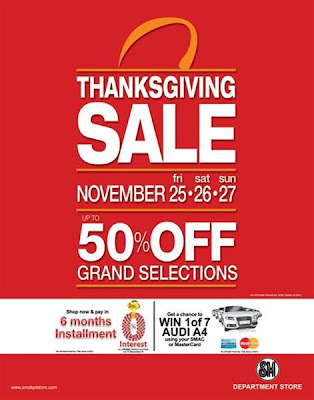 Thanksgiving Day sale is happening today at SM North Edsa. The Thanksgiving sale started from November 25, 2011 to November 27, 2011. You can enjoy up to 50% off on their grand selections. This is a Thank you weekend sale by SM North Edsa as they say on their SM North Edsa fb fan page. Is a great thanksgiving sale to buy some gifts in advance for our loved ones this Christmas season. This entry was posted in Promos & Sale and tagged Thanksgiving Day Sale at SM North Edsa. Bookmark the permalink.